I've been griping about drugstore not having any cool stuff much less cool holiday stuff for months now. Well, I stand corrected. Sinful Colors pulled through for me a little bit this year and released a few holiday colors that caught my eye. I was shocked because while I like Sinful Colors, they don't always standout as unique to me in this day and age. Plus, they have so many re-promotes I never know if something is really new or not. This color is new though! 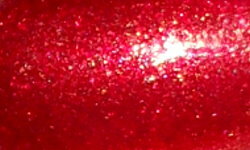 Velvet Ribbon is a red foil metallic with gold shimmer. Color: Well all be, I haven't seen a true foil polish in a long time! Foils are one of my favorite finishes too. This one is excellent! This is the perfect Christmas red and that gold shimmer blended in gives this beautiful shiny finish. This looks like shiny Christmas wrapping paper. No brushstrokes with this one which makes it a true foil, it's all made up of lots of fine shiny particles. Formula: Excellent 2 coat formula. This applies so smoothly and opaquely. Overall: Perfect holiday red polish.! I love that this a foil. I haven't seen foils done much less done well in nail polish in a couple of years. This is beautiful, vibrant, and oh so shiny. Way to go Sinful Colors! I'm a happy camper!